Wheat stands in one of the most vital, and often understated, components of the 21st century human’s diet. From pasta and bread to beer and even candy, this vital grain appears in countless dishes around the world in numerous forms. Although on the surface it may seem that it is grown by simply planting a seed in the earth, in reality the origins of the wheat that we know and love today are much more complex. Few people are aware that the world offers a broad range of wheat types, and that it was only through a long, arduous process of experimentation and trial and error that the variety most common in Canada came to exist. The first appearance of wheat in our country also coincides with the arrival of some of the first settlers, a fact that further cements the vitality of the crop. As pioneers continued to expand westwards, so too did the fields and plantations. The first large planting likely occurred in 1812, with a group of Selkirk settlers banding together to sustain a large crop. At this time, the variety of wheat was entirely dependent on the country from which the explorers had originated. Most of these types had difficulty withstanding the Canadian weather conditions and produced low quality bread when baked. It was not until the Red Fife type of wheat appeared in Ontario that any crops managed to be particularly sustainable. Red Fife proved to be very impactful on our growth as a nation, as it lead to the widespread appearance of farms as well as an increased need for infrastructure such as railways. Despite its resilience to the tough conditions of the Canadian landscape, scientists such as Dr. William Saunders noted that Red Fife matured rather slowly when compared to species such as the Indian Hard Red Calcutta. Taking this into account, he and other pronounced agriculturalists set to attempting to create a cross between the two varieties. Using cutting edge plant breeding techniques, Saunders’ son and prodigy, Charles, continued to hone and improve on the new breed his father had created, two types of which were henceforth named ‘Marquis A’ and ‘Marquis B’. Sanders Jr. became known for his dedication to producing the ultimate crop, using simple, yet effective techniques such as a self-crafted chewing test to perfect his venture. Though it may be easy to scoff this experimentation via chewing, by working his way through hundreds of generations of wheat, Charles was able to choose the varieties that produced the largest, most durable yields in the shortest period of time. Ultimately, the efforts of the Saunders family paid off, literally. When the Canadian Pacific Railway offered a prize of one thousand dollars worth of gold for whoever could produce the best wheat, Charles won by a landslide. His victory crop matured earlier, yielded more grain, and was more compact than any of the competitors, rendering previous contenders such as the Red Fife virtually extinct. Following that day, the legacy of the Marquis wheat continued to grow, until only seven years later when it came to encompass a majority of the crop acreage from Southern Nebraska to Northern Saskatchewan. 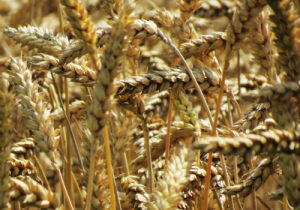 From propelling allied economies during the Great War to opening a whole new world of plant breeding, Saunders’ experimentation ultimately paid off in almost as many ways as we have uses for wheat. Even today Marquis is one of the most widespread crops available in Canada, making its way into bakeries and restaurants on an unprecedented level. As for Charles Saunders, he himself will go down in the annals of history as being one of the most important agricultural figures not only in Canada, but also the world. We hope that you have enjoyed this excerpt from our nation’s history, feel free to stop by and have a taste of some of our quality Marquis Wheat Loaf made fresh at any of our two locations!